Anyone who has ever experienced motion sickness knows it’s no fun. Medications are available to prevent sea sickness and can be a big help, but they also can have side effects. I like to SCUBA dive. Dive boats are notoriously small and can bob and roll in even relatively calm seas. Sea sickness is often a problem for divers while on-board the boat. But diving requires a clear mind in order to stay safe underwater. You need to stay aware of your surroundings and make smart decisions. As a diver your life and your buddy’s life depend on this. How do I prevent motion sickness without drugs? I use acupressure. Today I’m going to show you a point you and your buddy (or enemy- why not be nice and make friends?) can stimulate on each other to prevent or treat motion sickness. 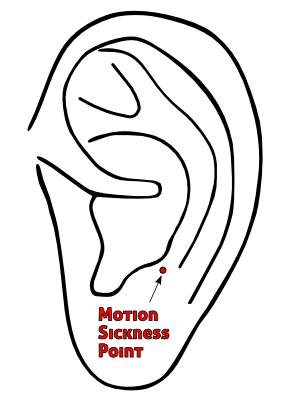 The point I’m sharing with you today is located on the outside of the ear. I have marked the point on the ear diagram to the right. The point is small, so you will need to be precise. To find the point probe around a bit and try to find the most tender spot in the approximate area I have marked. It should be pretty close to where I have placed the red dot in the diagram. I normally stimulate the point with an ear seed, which I consider the ideal method. Ear seeds are great because they can stay in place for days. In a pinch you could use anything small, hard, and blunt to stimulate the point. The tip of a retractable ball-point pen works fairly well as does the end of a wooden matchstick. The corner of a fingernail can also work when you have no other options. To stimulate the point apply pressure on the point for about 30 seconds. You can repeat this as needed, such as when you feel nausea returning. I suggest doing it at least a few times every 30 minutes if you have started to feel sick. If you are using it strictly preventatively you can stimulate it maybe every hour or two at first, and then as you think of it during the day.